I just can't believe it's been so long since I've written here. Then again I haven't written at my PhD blog since midterm! I think the lack of blogging sums up how ferociously tough this semester has been. So much has happened in the world, in my life that I wish I had time to write about. Of course this is where I slap myself for thinking that my voice missing for a few weeks is a big deal. Then just a few days after telling the world that he/we had more important things to focus on, President Obama freaked out everyone by calling a press conference at 9:30 pm Chicago time on a Sunday. ON A SUNDAY! Twitter didn't know what to do with itself. We were making jokes about the zombie apocalypse, speculating that we were going all in to remove Gaddafi from Libya and even just dumb jokes about the President only wanting to interrupt "Celebrity Apprentice." Then word got out that it was about Osama bin Laden, that we just might have killed him. The jokes continued as we impatiently awaited our President to tell the world what happened. Sure word leaked onto Twitter and slowly the TV news folks let the cat out of the bag. But I wouldn't fully believe it until President Obama said it. "Darkness cannot drive out darkness; only light can do that. Hate cannot drive out hate; only love can do that. Hate multiplies hate, violence multiplies violence, and toughness multiplies toughness in a descending spiral of destruction....The chain reaction of evil--hate begetting hate, wars producing more wars--must be broken, or we shall be plunged into the dark abyss of annihilation." 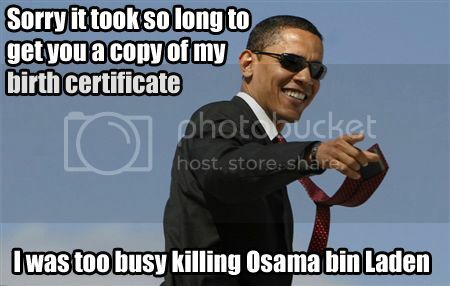 Justice can't be found through bin Laden. It can only be found through us. How we go about the world. How we treat each other. How much love and light we put into the universe. This morning we decided to talk to our daughter about bin Laden. My husband has a different view than I do. But he presented his view to her and I presented mine. She's only 7 1/2, so I don't expect her have much of an opinion other than "Happy the evil guy is gone." I think I struggled more with trying to explain "evil" to her than the difference in Mommy and Daddy's opinion. She's use to us disagreeing. I'm still struggling with my emotions over all of this. I remember all too well what bin Laden did to this world. While I was not in NYC that day in 2001, I had friends, close friends who were. I remember hitting my listservs and asking for people to check in. We didn't have Facebook, Twitter or too many blogs. I remember calling Jenn Pozner and letting out the biggest sigh when she answered. But I was in Chicago and no one knew what was happening. My husband worked at a museum and I at a university. Both, we were told by the media, could be targets. We were back home before lunch. I'm not being an idiot about this. But I know I'm not being 100% practical about this either. Life is messy like that.